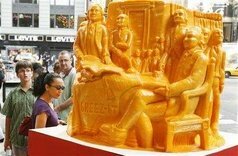 A sculpture of the signing of the Declaration of Independence made from a one-ton block of cheddar cheese glistened on the sidewalk of Times Square in New York on Thursday as an artist's tribute to the Fourth of July. "It's very patriotic ..." said Troy Landwehr, who carved the sculpture for cracker company Cheez-It to celebrate U.S. Independence Day. He worked eight hours a day for a week in a 40-degree cooler carving the block of Wisconsin cheddar. The replica of an iconic painting by John Trumbull shows John Adams, John Hancock, Benjamin Franklin and others standing around a table signing the historic document. As a Manhattanite, I'd expect such a thing more likely to appear in Wisconsin. But I guess I'll take a walk up and take a look today. And kudos to the big marketing brains at the Cheez-It company -- they think like Americans! An umpire teasingly calls him "Bat Man." His teammates consider it an embarrassment and a "slap in the face." ... it sounds like the punchline of a cruel joke, or maybe an episode from baseball's more colorful past. That's it, always look for the opportunity in a situation -- it's the American attitude. And what could be more American than guns and cars? A car dealership in the United States is offering a free handgun with every vehicle sold. Max Motors in Butler, Missouri, says sales have quadrupled since the start of the offer. Customers can choose between a gun or a $250 gas card, but most so far have chosen the gun. Owner Mark Muller said: "We're just damn glad to live in a free country where you can have a gun if you want to." Well, maybe ... cars and beer (and grandma)? Lynne Rice of Norwalk reportedly announced, "I'm here for beer," after plowing her 1988 Cadillac through the front window of Joe's Food Mart, 10641 E. Imperial Highway, at about 6 p.m. Sunday, said Deputy Jeff Tibbetts of the Norwalk Sheriff's Station. The owner of Joe's Food Mart, Atef Awada, says he has surveillance footage of Rice getting out of the car after the crash, walking over to the cooler and pulling out a six-pack of beer. "Suspicion" ... That's American understatment.